We hiked into Red Tank Draw east of I-17 at exit 298 today. We'd set out with the intent to hike a few miles up the Bell Trail beside Beaver Creek this morning, but it was slammed, both the main parking lot and the overflow lot up the hill from the trailhead were full. So we backtracked about a half-mile and parked the car in a turn-out near the one-lane bridge that passes over Red Tank Draw, which looked quite inviting beneath an ample canopy of cottonwoods and sycamores and was flowing a bit with monsoon runoff. We'd not hiked Red Tank Draw before, nor do many it would seem (though I have since learned there are some nice 'glyphs in the vicinity). We walked perhaps a mile downstream from the bridge and saw not another footprint, but we did find a lovely babbling stream and a few warm pools which the dog and kid enjoyed. 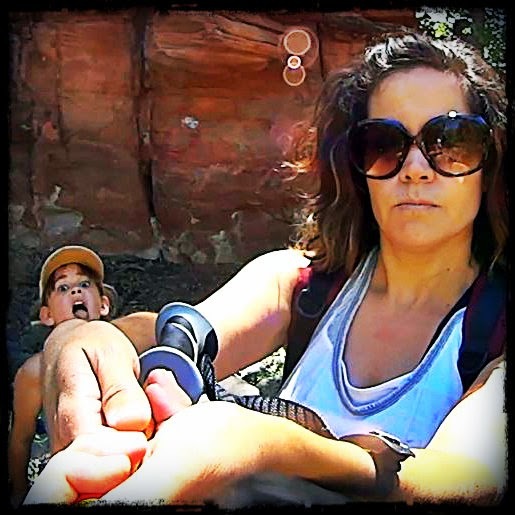 I brought along my new ski-pole mounted video camera (I've been watching a lot of ski videos lately and was inspired to fab one together out of bits and pieces I found in the garage the other night) and I let our kid run around with it much of the time while we were hiking today. Below is the video we made after we got home, which I think is quite charming. YMMV, however.